To tell you the truth: I could eat this dish every.single.day! No exaggeration, no over-praising just pure honesty my heart & my belly speaking. I am in love with falafel, sesame and other goodness of the arab cuisine for a long time. But ’til now I always ate the falafel balls either fried in lots and lots of oil or covered in something rather fatty. Mixed with roasted sweet potatoes and no oil at all, this baked version is not lacking any of the flavor or crispy-ness than its fried brothers. They have a rich and sweet taste and topped with the sauce – it is really an addicting composition. Besides of topping my salads, the little balls made their way into a sandwich, a lettuce wrap and as sort of a meatball on spaghetti. No boredom allowed! Obviously versatile – but also good on its own ( irresistibly bite sized). nutrient categories. Among them are anti-inflammatory nutrients, blood sugar-regulating ones and antioxidants! Compared with other vegetables – fiber content, complex carbohydrates, calcium, iron, protein, vitamins A and C – the sweet potato is ranked highest. The beta carotene is better absorbed with some fat, where the creamy tahini sauce comes into play. 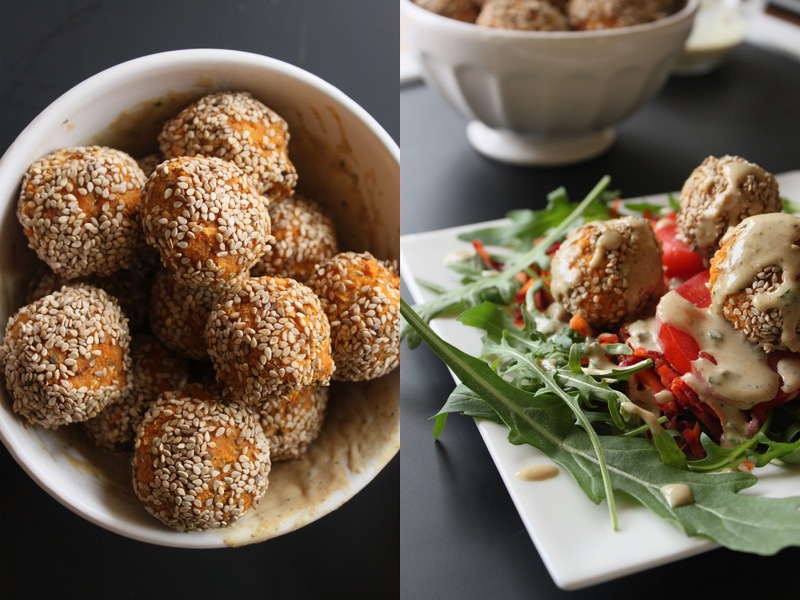 Falafel + tahini are best friends and are one of my favourite food-friend combinations ever. forever! Ready for some f l a v o r e x p l o s i o n? Peel and cut the sweet potatoes, place them on a baking sheet cover with a little bit of coconut oil and roast for 20 minutes. Mix all of the ingredients together in a food processor. Let the mixture sit in the fridge for 15 minutes. Roll the falafel dough into balls and through some sesame seeds. Put them in the oven for another 10-15 minutes. The longer the more crunchy they get. Combine all ingredients and blend in a food processor. Add more lemon juice or a little bit of water if you want a thinner dressing. Store in a glas jar in the fridge. Enjoy! Your tastebuds can thank me later!